Though many people prefer a matte base during F/W, my dry skin can use the extra glow during the colder months. I do notice I gravitate more towards more covering bases as well. These ones are a combo of both : (light) medium coverage + glow. 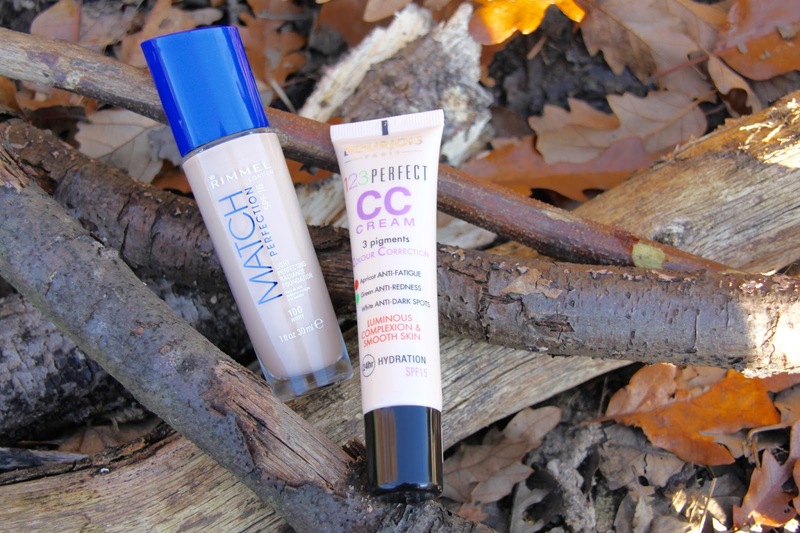 Rimmel Match Perfection (€ 12.99) has been with me for a long time, and I trust it to give me exactly what I want during this time of the year. It provides medium coverage, gives radiance and stays put all day. I wear shade 100 Ivory, which matches my pale skin. It also applies so well, sinking into the skin perfectly. You can read a full review here. The Bourjois CC Cream (€ 15.00) is the 'weekend option'. This does what the Rimmel one does, but with less coverage. I love bases that give the illusion of real skin and both of these do. They also wear very well throughout the day : they don't cling to dry patches or oxidize. What are some of your F/W favorites?